A nice way to turn down dinner? One of the hosts has a horrifyingly filthy kitchen. I'm not talking 'Oh, I've been cooking all day so it's a bit messy' dirty. 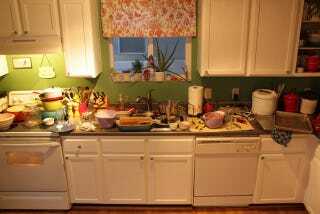 I'm talking dishes from days before piled in the sink, crap piled all over the counters, and a patina of grunge on every surface. I know what a kitchen explosion looks like, and this is not it. She just doesn't clean her kitchen. We just don't want to eat anything that's come out of her kitchen, but she really, really wants to cook for us and take her turn hosting. I think she's one of those people who don't see a mess. I thought we had an out when we switched diets, but instead she bent over backwards to meet our new dietary requests! She's sweet! Just... a slob.